"[This is] easily the author's best book.... The novel is a fabulist satire, or a satirical - fantasy. The novel has variously been characterised as a meditation on the autonomy of literature, on the immortality of the artist, existence, non-being and reality."" - Rüdiger Imhof, The Irish Times. About two-thirds of the way through the 1929 novel The Various Lives of Marcus Igoe by Brinsley MacNamara (the pseudonym of John Weldon, 1890-1963), the eponymous hero hits upon a scheme of monumental spite. To memorialize his victory over the small-minded villagers of Garradrimna who have ever thwarted him, he determines that he will erect a statue—of Marcus Igoe. "He felt quite certain they would never be able to stand it," the narrator tells us, "this brilliant notion of putting up a monument to himself. "1 Although the statue would both immortalize him and mortify his neighbors, Marcus eventually decides his victory would be a Pyrrhic one, because a timeless statue would impoverish the subjective variousness his battle against the town's conformity had produced. He asks of the monument, "would it be only a part of himself, or which side of him would be uppermost when the thing was done?" (VL 185). Marcus must not only decide between the permanence of a monolith and the variety of his many sides; he also must concede that a finished statue—like the achieved selfhood sought by the protagonist of a would-be bildungsroman such as Various Lives—would snuff out "the many future lives he would yet live in various stages" (VL 236). 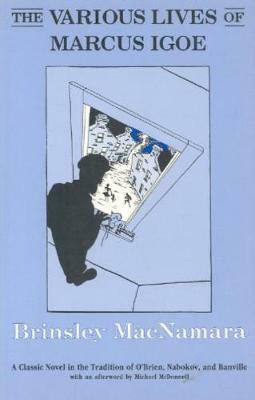 The Garradrimna of The Various Lives of Marcus Igoe remains the same spiteful place, complete with the constant surveillance of the "squinting windows," but the protagonist's struggle against the town has become a structural given, announced at the novel's beginning and consistent throughout, rather than emerging over the course of the narrative as the result of the oppressive particularities of Irish life as exposed by a diagnostic realism. The first chapter declares that Marcus Igoe's "mood of combat with the life around him" is "permanently fixed" (VL 8), and all of the loosely connected plot lines that follow commence, unfold, and resolve as failed skirmishes against the town. But the comic grandiosity of Marcus's monumental gesture—his very name puns on the phrase "mark as I go"—combined with the several other fantastical attempts to achieve "a memorial, an enshrinement" of his "ultimate triumph over Garradrimna" (VL 198) signals MacNamara's departure from the genre of "avenging realism"—the term John Wilson Foster uses to characterize MacNamara's fiction in the Cambridge Companion to Irish Literature in an incisive chapter that nevertheless omits mention of The Various Lives of Marcus Igoe. When this novel was first published in 1918 the book evoked the same reactions many people imagine only happened with Satanic Verses; it was publicly burned in the village where MacNamara lived and he was forced to leave. The author's powerful study of a rural community haunts readers' minds and imagination. In 1918 a seemingly unremarkable novel appeared for the first time, published by Sampson Low, Marston, a small publisher in London, the novel was called The Valley of the Squinting Windows and was it written by Irish author Brinsley MacNamara (real name, John Weldon). MacNamara came from a small rural village called Delvin in Co. Westmeath in the midlands of Ireland. The novel tells the story of life in a rural village (Garradrimna) in Catholic Ireland at the beginning of the 20th century and the power of gossip and public perception of an inward-looking society. The last time this novel was officially read in publicly was the year of its publication in 1918 on the steps of Clonyn castle to the gathered villagers of Delvin. Understandably, the locals were excited that one of their own had written a published book. During the reading, the locals quickly realized that the fictional characters in the novel were representative of the people in and around the village of Delvin. Pride instantly turned to hostility and an ensuing national scandal in Ireland. Copies of the book were burned in the centre of the village and MacNamara found himself hauled before the courts and ordered to pay compensation. But the villagers, so insulted by MacNamara’s novel, turned their anger towards the author’s father, James Weldon, who was principal of the national school at nearby Balinvalley. Parents refused to send their children to the school. Ultimately, MacNamara’s father was forced to emigrate, and Brindsley himself left Delvin never to return. MacNamara’s novel has been reprinted several times by Anvil Books UK, often when interest in the scandal re-emerges. 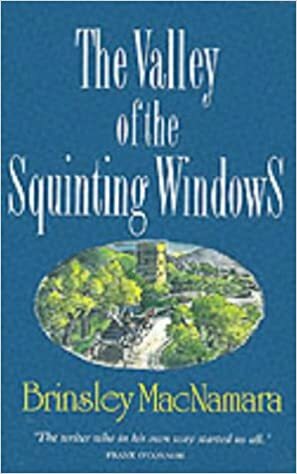 In fact, the phrase itself, valley of the squinting windows, has become a colloquial term, particularly in Ireland, to describe a society obsessed with providing neighbours and peers with a good perception of one’s personal matters, sometimes at any cost. Ninety-two years later, the locals of the Delvin community have decided it is time to move on, and a reprise reading of The Valley of the Squinting Windows will form part of Delvin’s Book Fair on 2nd May from noon until 6pm. So far, book donations have been extraordinary and it is on course to be Ireland’s largest ever book fair. As part of the fair, Irish celebrities, including actress Mary McEvoy, who lives locally in Delvin, will publicly read extracts from the novel. Current book donations continue to be taken and organizers are hoping that they will have in excess of 20,000 books for sale on the day. The book is a rather overwrought tale of a young teacher seduced by a wealthy, dissipated man and how a trainee priest who has fallen in love with her avenges this outrage. It owes more to 19th century melodrama than 20th century realism, and is closer in spirit to Peyton Place than to Madame Bovary, the latter presumably being what MacNamara had hoped to emulate. Born in Delvin in Co. Westmeath, Brinsley McNamara (the pen name of John Weldon) was a playwright and novelist. His portrait of Irish village life, "The Valley of the Squinting Windows" caused a furore when first published in 1918, due to its depiction of the meanminded inhabitants of his native village. His second novel, "The Various Lives of Marcus Igoe", is an autobiographical examination of the author's life and achievements written in the form of a dream.